Hey everyone! Humble host here. Please welcome Stan Gertz from FanDuel.com, who’s here to chat with you about those one of those tight ends in Fantasy Football. The New York Jets decided to address their awful offense over the summer. They brought in quite a few different options to help out in free agency, and they also drafted a few potential contributors as well. Most notably, they were able to grab former Texas Tech tight end Jace Amaro. Now that he is starting to settle in, there is a pretty good chance that he could be an integral part of the offense week in and week out. People in fantasy football are taking notice, and fans of the Jets are as well. When he first started to play in the summer, Amaro looked lost at times. There are pretty high expectations surrounding a guy taken in the 2nd round, but he was not figuring out his role for the New York Jets. Something finally clicked with him towards the end of the summer, and he has been playing at a pretty high level ever since. In fantasy football, the tight end position is pretty top-heavy. 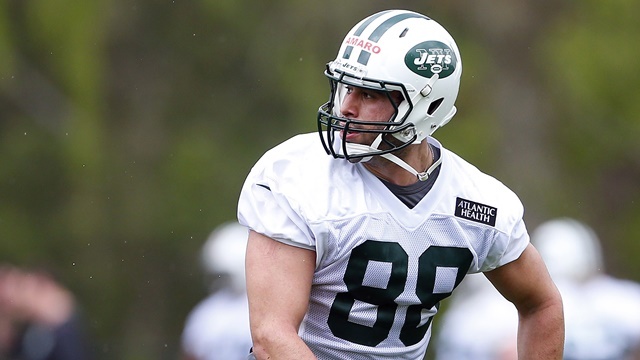 After the first five or so tight ends are taken, there are a lot of players who are around the same skill level. Amaro is one guy with a lot of upside, and he has shown in the preseason that he can catch passes in the red zone. Eric Decker is the new featured passing target in the offense for New York, but there is no reason why Amaro can’t be used in short passing situations. He has a chance to really fit in with the team he is on, and his size could create matchup problems if a team tries to stop him with single coverage. He could be a big reason why the team stays around as playoff contenders this upcoming season. That is how much of an impact he can have on a team desperate for offense.